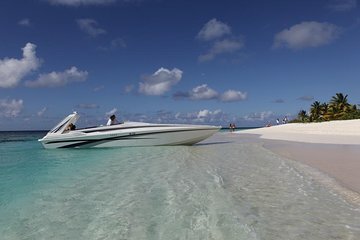 Charter your own speedboat to explore the waters of St. Maarten and Anguilla with ease. Create a custom itinerary with your captain and spend the day swimming in the pristine waters, snorkeling in the abundant reefs, and soaking up the sun on powdery, white beaches. Sit down to a hearty Caribbean lunch on the beach and enjoy an open bar of alcoholic and non-alcoholic beverages while you sail.